In the YaST install for OES, on the Installation Settings page, click Software to go to the Software Selections page. For information about the OES installation process, see the OES 2018 SP1: Installation Guide. 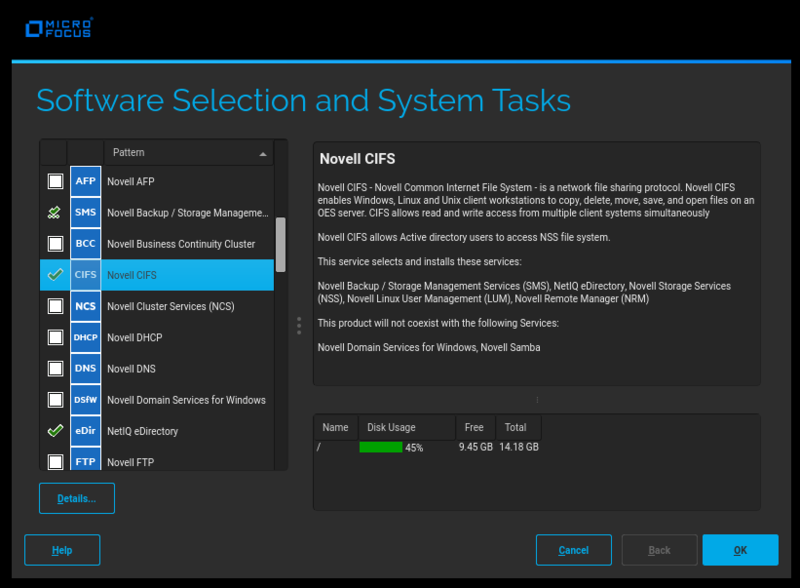 From the OES Services option, select Novell CIFS, then click Accept. Typical Configuration: A two-click express installation with minimal user inputs. This method collects only essential information to proceed with the OES configuration and uses default values for most options. In case you want to modify the default configuration parameters in the OES install summary screen, click the respective links and modify them. Custom Configuration: This method of OES configuration requires inputs for all parameters. On the Open Enterprise Server Configuration window, click Change and then click Novell CIFS Services. Select the IP address of the LDAP server from the Directory Server Address drop-down list. If you do not want to use the default, select a different LDAP server in the list. Browse or specify a user (existing or created here) with rights to search the LDAP tree for CIFS objects. If you selected the Use Common Proxy User as default for OES Products check box during eDirectory configuration, the Proxy user name and password fields are auto-populated. If a common proxy is not configured, the CIFS Proxy User Name field is populated with a system-generated proxy user name. Specify a password (existing or created here) for the Proxy user. This field is disabled if you selected the Use Common Proxy User as default for OES Products check box during eDirectory configuration. If a common proxy is not configured, the Proxy Password field is auto-populated with a system-generated proxy password. Retype the same password in the Verify Proxy User Password field. Click Add, then browse to search for an existing eDirectory context. Specify the list of contexts to search for CIFS users. They will be sequentially searched when CIFS users enter their credentials. The CIFS server searches through each context in the list until it finds the correct user object. For example, if users exist in ou=users, provide the context. If there are any users in ou=user1,ou=users, it is not resolved unless you have a subtree search enabled. The ou=user1,ou=users context must be added explicitly.